A press conference was held recently, formally announcing the cast of Kamen Rider Drive. Ryoma Takeuchi will be playing the titular hero Shinnosuke Tomari/Kamen Rider Drive. Moreover, the theme song is Surprise - Drive and will be sung by Mitsuru Matsuoka with a new band called the Mitsuru Matsuoka Earnest Drive. More press conference photos after the jump via Oricon. The story line concept will be fusing “Kamen Rider x Detective Drama” with riddles and case solving that a range of generations can enjoy. Also this is the first time that the main rider will be using a car instead of a bike which brings the series back to the original series wherein machine and humans are united to battle evil. The plot: android-like creatures called Roimyuudo desires to be human. Except for some of its leaders, they are spread across the net in "light" form. Using the platform left behind, the leaders plan to revive the original Roimyuudo and stage an uprising against mankind. Riku Sanjo, known writing Kamen Rider W will be the lead writer, series producer is Takahito Ōmori and director is Ryuta Tazaki. 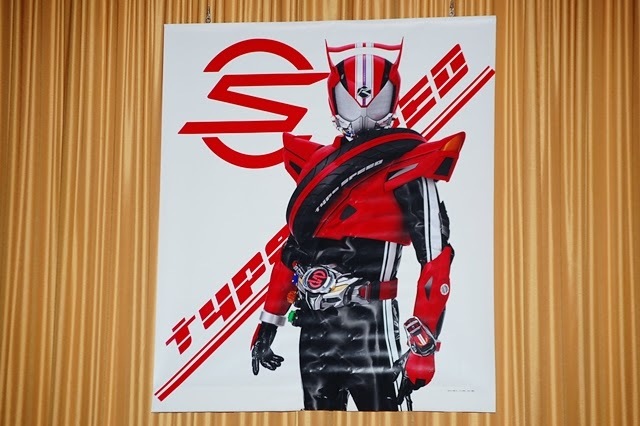 Kamen Rider Drive will start on October 5th.